"This is it – the biggest Star Trek series ever, spanning starships, centuries, and galaxies!" says Scott Tipton. "All of Starfleet's most legendary officers join together for the first time against some of the greatest threats they've ever faced. It's like nothing you've seen before!" 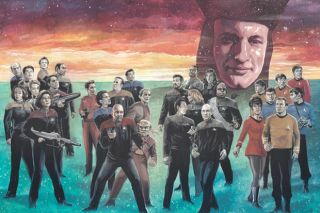 David Tipton adds, "But it wouldn't be Star Trek if it wasn't also about character, and with so many Starfleet legends crossing paths for the first time ever, The Q Conflict will give readers the opportunity to see all their favorite characters in a brand-new light." "Being at work on Star Trek: The Q Conflict is like coming home after a five-year mission away," says David Messina. "To draw characters like Spock and Picard at a time that's so exciting for the Star Trek franchise? It's awesome."